Why my neighbors are more awesome than yours: Because one of them — Alisha — made me this cake. Which is no ordinary cake. It is, in fact, a Coke Zero cake. Yes, yes. Made with the refreshing zero calorie goodness of Coke Zero! Although the cake itself is not calorie free. That would be silly and wrong. There is no such thing as a zero calorie cake, and if there were, it would be an abomination, some sort of mad flavored sponge designed to give starving supermodels something to do with their mouths besides jam endless Camel Lights into them. This is not that. No, this is loaded with calories and Coke Zero. Heck, even the frosting is made with Coke Zero. The is the most awesome cake made with soda ever. I hesitate even to eat it. However, Krissy and Athena have no such hesitation, so it’s going to get eaten later tonight no matter what. Might as well join them. Thanks, Alisha. Your Coke Zero cake is deeply appreciated and revered. Will your nice neighbor part with the recipe? I’m duly impressed by the Coke Zero frosting though. As far as I’m concerned, frosting comes from little tubs from the supermarket. While Coke Zero made me a convert (I was a true Pepsi fan my whole life), and I think it’s an amazing beverage, I don’t understand how 1 can of it can replace eggs, oil, and water. But then again, I did fail chemistry in high school. I second the request for the recipe… and there’s no way a proper cake could be made entirely substituting soda for egg. Wouldn’t have a decent texture. Applesauce, maybe. Pudding, perhaps. Cherry Garcia Ice Cream, definitely (though that might spoil the whole Vegan thing…) But soda… nah. 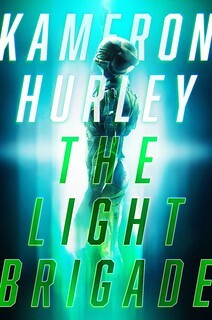 @KateH I was surprised when I first read about it too. Figured it was worth the $3 or so in ingredients to try it. The yellow cupcakes smelled a little fruity at first, but that dissipated after a bit, and no one could tell there was anything weird about them. I suspect cake mixes are made of magic. A truly excellent neighbor. We should all be so lucky. I would, however, prefer my chocolate cake and frosting made with Guinness. One must have standards. Someone Photoshopped an Akita into the upper right corner of that pic. Dreadful job they did, too. Mmm…Coke Zero cake. Wonder if one can substitute Pepsi One. I know you’re supposed to let wine breathe, but cupcakes? If by “magic” you mean “strange substances with unnatural origins and unpronounceable names” you may be right. Q: What egregious offenses have you committed with this picture? In the interest of brevity, name only the top three. Extra Credit: Name the most offensive thing about the picture. Bonus – NO RADIANT GODDESS! I was about to make some slightly snarky comment about it being Mardi Gras and it not being a king cake, but that’s just too nice and too cool of a gesture. Awesome neighbor, indeed. Hey John, who shrunk your dog? No – partial credit only. First Rock Sugar mash up, now this. How much more awesomeness can the Universe take? In other words, be creative =) Whipped cream as frosting = very few calories and still tastes great!! Just a cake? My next door neighbor built me two rooms and a garage! …well, not for free, but he did an awesome job. This is small town living at its finest. In big city living, you never eat what your neighbors bring you. God knows what atrocities are in it, or, at least, so we are led to believe. Oh, wait, I already know: because I’d hide under the bed when they knocked at the door. I’m guessing the photo was taken seconds before Kodi did an impressive bullet-time leap into the air over the counter, devouring the cake in a single gulp. I believe chang, winc, counts Coke Zero itself as an offense. I don’t do artificial sweeteners, but I’m definitely going to have to try a full-calorie decaff soda in a cake mix. I have a friend who makes amazing apple dumplings with Mountain Dew, which I normally hate, so I’m willing to experiment. So, you get a new and exciting type of cake and you don’t save even a tiny bit for mass-spec analysis for reverse engineering? The coke is a lie. Had to do it, sorry. I assure you my radiance is in there. It just so happens my fur’s color bears a striking resemblance to “Coke Zero frosting”. Don’t cotton to those any more than Coke Zero recipes. Sounds like the perfect experiment for the birthday at our house today. Thanks for the inspiration. There’s a pistachio cake-from-mix that my wife likes that uses 7up. Mix all until smooth (about 2-3 minutes), pour into greased & floured 9×13 pan, bake at 325ºF for about 45 minutes. I top it with another box of pistachio pudding, whipped into 8 oz of cream cheese & 8 oz of butter. 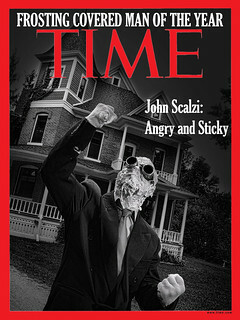 This Scalzi guy’s neighbors may be cool, but also ridiculously indulgent. I love both cake and Coke Zero. But you are incorrect on one count, sir. In Birmingham, AL there is a Greek restaurant by the name of Taziki’s. In this house of deliciousness, there lives a calorie-free chocolate cake. It will change your life. Forever. The other weight watchers recipe that is making the rounds is the one using a can of black beans and brownie mix. Either drain the black beans and refill the can with water (or use straight from the can, liquid and all). Puree beans and liquid add to boxed brownie mix and bake following package directions. After the Super Bowl, quite a few WW members bragged about how none of their guests could tell the difference. 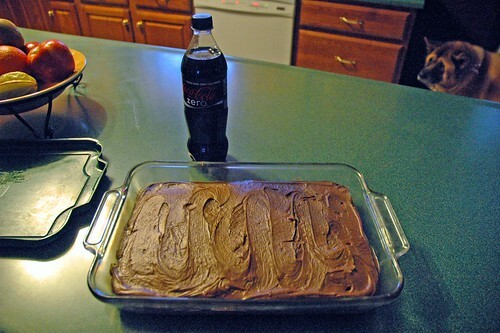 The original Coca-Cola Cake recipe dates back at least to the 1950’s. Somewhere in a box out in the garage, I have a collected-recipes booklet from one of the first Pillsbury Bake-Offs (about 1955, IIRC), and Coca-Cola Cake was one of the entries. Baking Bites recently did a post on Coca-Cola Cake, with some adjustments to the recipe to favor the Coke flavor more strongly. Also, not to add to the awesome awesomeness of your neighbor Alisha, but, like, wouldn’t she have had to deliver it to you THROUGH THE SNOW? “Classic Cooking with Coca-Cola” is a cookbook filled with great recipes using Coke and other Coca-Cola Company products. As a former city slicker/now rural girl, I also smiled at something else no one’s pointed out yet: The cake was baked and delivered in a Pyrex cake pan, not a flimsy disposable aluminum pan. And Pyrex bakeware is not cheap! But obviously you’re going to eat the cake, wash the pan, and bring it back to your neighbor’s house. Because that is how life works out here. You had me at Coke Zero…delish! The KC science fiction club is having a chocolate-themed meeting this next Saturday evening. I’ll be making schadenfreude pie Friday night since Saturday we’re spending the day running to and fro. You seem to have a thing for Coke Zero, don’t you? Awesome! Tell everyone I said hello. A cake mix box! I snobbishly look down upon your boxed convenience — and it’s not really my own recipe. I refer you to: http://www.thecoca-colacompany.com/heritage/pdf/RECIPE_colacake.pdf with the comment that I have found through experience that it works just fine if you just mix in the baking powder with the rest of the dry ingredients, and you really must bring the coke and cocoa mixture to a full boil. Warning: Frosting is addictive. @38 – It was indeed delivered through the snow, but not on the snowmobile. Although I thought about it . . . .
One day soon I’m going to get ambitious and make this Dr. Pepper Texas Chocolate Cake. Thanks, Alisha; that one is going into the try-it pile. just noticed this. I really love the slightly out of focus, forlorn looking kodi in the corner.